Thursday comes and we say sad goodbyes to Ramiro and Lorenzo as we pack our bags in the car and Azul drives us to the city. We are going to stay with her mom, Marcella and her lover, Diego, in Villa Crespo for two nights. Villa Crespo is a middle-class suburb in the centre of Buenos Aires..very much a place I could live even though we arrive in a very hot Buenos Aires. It is already 20:30 and still 37 degrees Celsius! We were warned about the city and her dry heat flushes in the month of January. I’m very excited for our stay because Marcella is hilariously funny and she is an excellent vegan cook. If Marcella did all the cooking for me I would be vegan with no problem. So for dinner we have delicious quiche pie and fresh salads. We chat and wine and laugh and love life! On Friday 17 January we decide to visit the historic area of La Boca, specifically Camanito, a street museum in an alley way, which means little path in Español. This area used to house the fishermen of Buenos Aires right on the port of the city, and is known to be one of the dodgier areas in town. Now the fishermen weren’t the wealthiest of men and when the time came to paint the outside walls of their homes they couldn’t really afford to buy buckets of paint. A nifty solve to this problem was just to take any paint in any colour from donations that they could find. 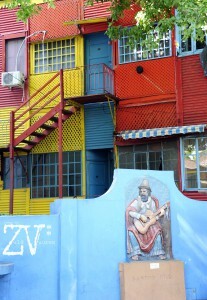 This resulted in houses built right on top of each other being painted all the bright colours of the palette. 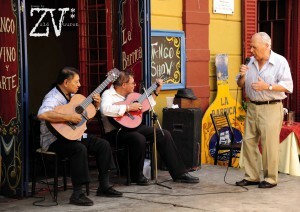 This colourful oddity in the city started attracting attention and over the years has turned into somewhat of a tourist trap with vendors of all sorts trying to sell artwork of various interpretations of the Tango – the dance Buenos Aires is famous for. 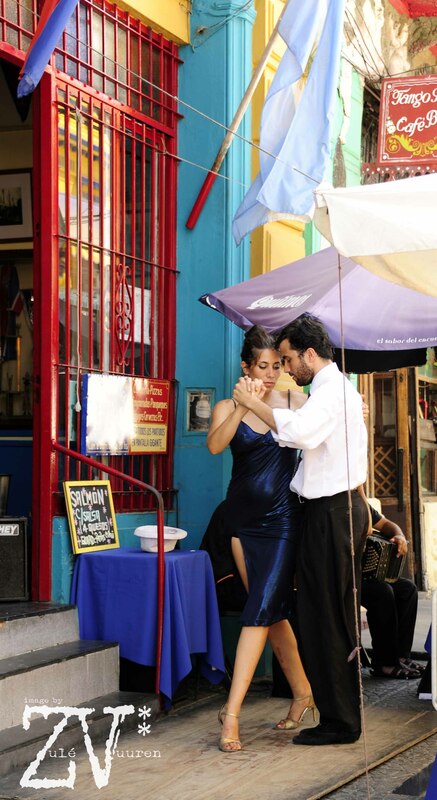 There are couples on little stages in front of EVERY little restaurant in the little street of Camanito dancing the Tango – quite something to see. Pictures come at a price if you’re not quick enough with the shutter. It takes about 30 minutes to see all there is to see in Camanito, and now we are hot and sweaty and we need to sit down. We park on a little bench and watch the world go by while gathering some more energy to venture on. While we take a breather a young guy walks our way. He asks for a lighter..and that is how many of the best conversations start. 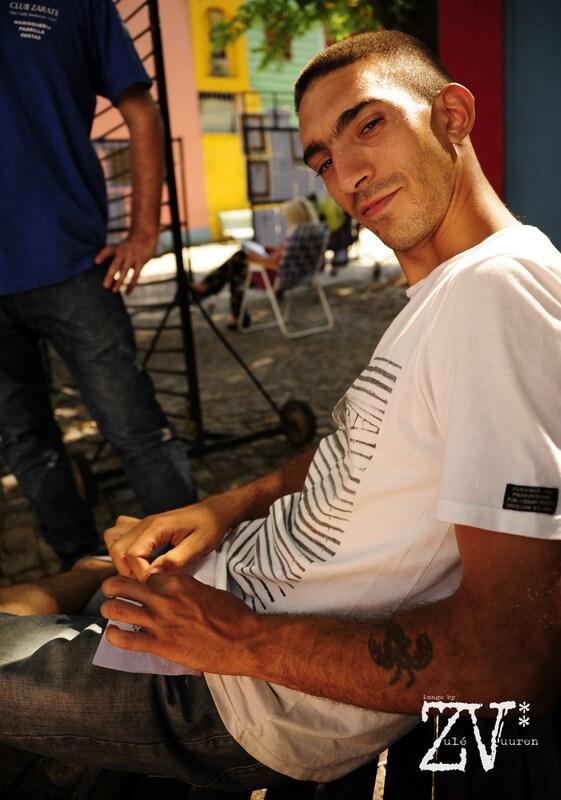 We smoke together and he tells us his story – Axl is his name and he has lived in La Boca for all of his 28 or so years. He is a flyer boy, and has been for the last 7 years. He spends his days on the street corners of Camanito and uses his wit and charm to seduce tourists and get them to eat at his boss’s restaurant. I’ve been watching these flyer boys for a few minutes and he is most certainly the best of them. During the last 7 years working the circuit he has learnt English, Portuguese, Russian, French, Italian and even a little bit of Afrikaans! This boy definitely has a gift, and his dream is to start his own restaurant, work hard at it for a few years and then travel the world. Make it work! It was a highlight of our day to meet Axl. 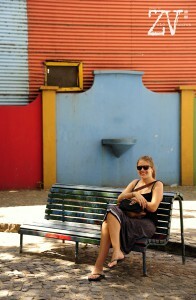 After making a new 5 minute friend on the streets of La Boca, it was just natural to feel some munchies coming on. We walk through the back streets of the ‘hood, the REAL La Boca, where the houses aren’t painted in colours and the people don’t speak more than Spanish. We stumble upon the BEST ice cream shop so far on our travels. On the corner of Suarez and Avenida Almirante Brown there is a non-descript little family owned shop where 2 huge flavour scoops are stacked on a cone for only 18 Argentinian Pesos. These small places always have great ice cream for the best price. Always support the little guy! 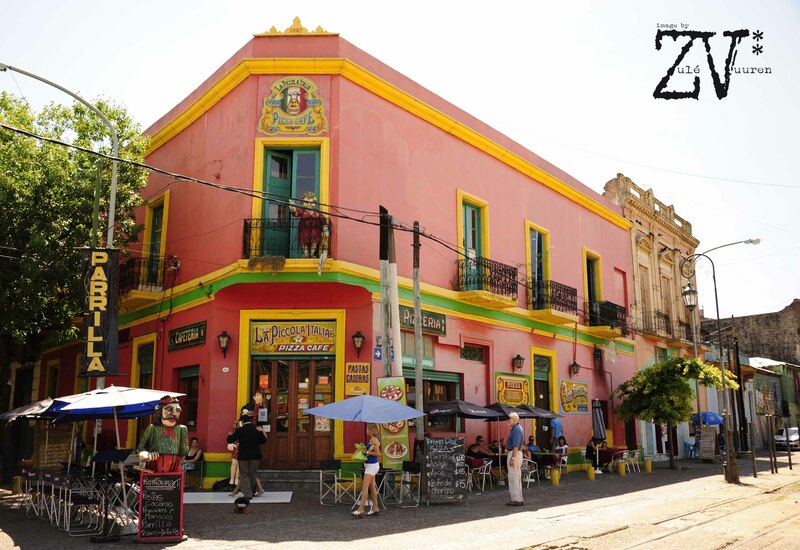 Palermo Soho is filled with trendy shops and restaurants, little plazas with markets and musicians – the type of place we would live and be if we were residents of this beautiful airless city. Saturday, 18 Jan, comes and it is Marcella’s birthday! We sing Happy Birthday and we give her 2 bottles of red wine as a gift. 2 because good wine is so cheap in this place that 2 would do. That is how the government distracts its citizens – alcohol and cigarettes are very cheap here by international standards. We are planning to be at our CouchSurfing host at about 1pm – but we procrastinate all day, with the help of Marcella feeding us her magnificent cooking and obviously forcing us to drink all that wine with her at lunch time. Tonight Bart takes us to a friend’s house to watch a very important football match. Boca Jnrs vs River. We are told that we are now Boca supporters. These two teams have had years of rivalry and the fans of both sides are very passionate about the beautiful game. We drink beer and eat very cheesy pizza and laugh with the boys. It’s nearing 1am and they are ready to go out clubbing and we are ready for club duvet.. 6 of us squash into a 2 door Fiat and they drop us at the bus stop. “Have a drink for us guys!” We make our way back to Bart’s apartment and hit the mattress hard. Tomorrow some last bit of sightseeing before we leave the city of Buenos Aires for the mountains and fresh air of Cordoba. Bart stumbled in at 5am or something so when we wake up we take a walk to the corner shop to get some eggs and fruit for breakfast. Just as we get back Bart awakes groggily and we offer him an egg breakfast to help with that slight hangover. Today we are off to Recoleta and he is our personal guide. 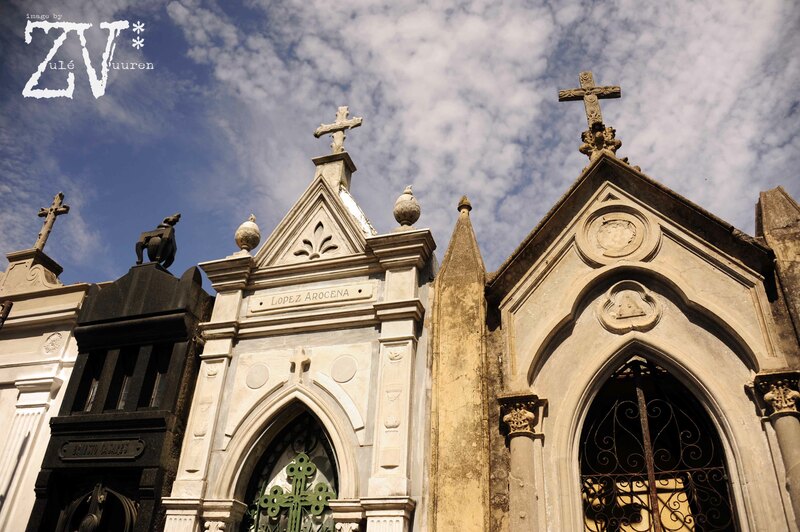 Recoleta is a historical cemetery situated in a calm, leafy upper-class suburb where the rich, famous and politically influential has found their final resting place. The graves of past presidents, writers, and the most famous, which is that of Eva Peron, can be found here. There are hundreds of people here already and the sun is beating down on the dry earth. I’m not one for big crowds, and I really just want to see Eva’s tomb. We wander around looking at the obnoxiously over the top mausoleums where generations of affluent families are entombed. 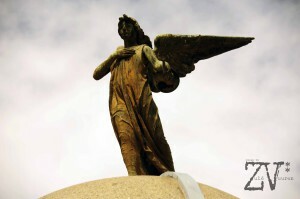 Some are quite amazing with elaborate statues of angels, Jesus and the Mother Mary. It’s all very Catholic. 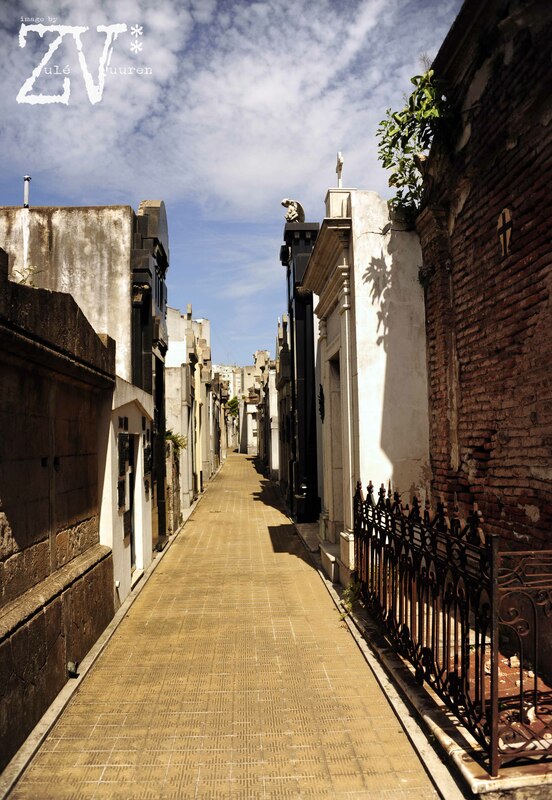 We search and search for Eva’s tomb and need to go back to the entrance, twice, to check the park map before we finally find the narrow alley where her whole family rests. If you are ever there looking for it, it’s the one with all the plastic flowers tied to the gate. Other than that it’s not very extravagant, just a few plaques of remembrance on the wall. We saw what we came to see, took a picture or 2. We are all pretty tired and a lie down in the park at Puerto Madero will be just perfect. Puerto Madero used to be the only pier where goods were delivered to the city and it has undergone a modern revival of sorts recently. We take a bus to the very modern part of BA where trendy hotels, restaurants, apartment buildings and boutiques look very comfortable. There is also a big, public park right on the water. Our first stop in the area is the Freddo Ice Cream shop. Freddo is one of the biggest and oldest ice cream brands in Argentina, and according to Bart they make the best ice cream. I’ll be the judge.. We each order a “copina” which is a wafer cup with 2 flavours – to our surprise the cup is very mini with 2 tiny scoops of flavour for A$35!!! It better taste magical. It is pretty great, but the 2 massive scoops we got in La Boca for A$18 was way better. Maybe it’s better that we have a smaller one, we may have been over doing the ice cream lately. We make it to the vast expanse of a park where the more relaxed find themselves on a Sunday afternoon. It is beautiful, the sun is shining, the hills roll out before us, the air is clean, kids running, guys kicking footballs and girls laughing. It seems like a picture. 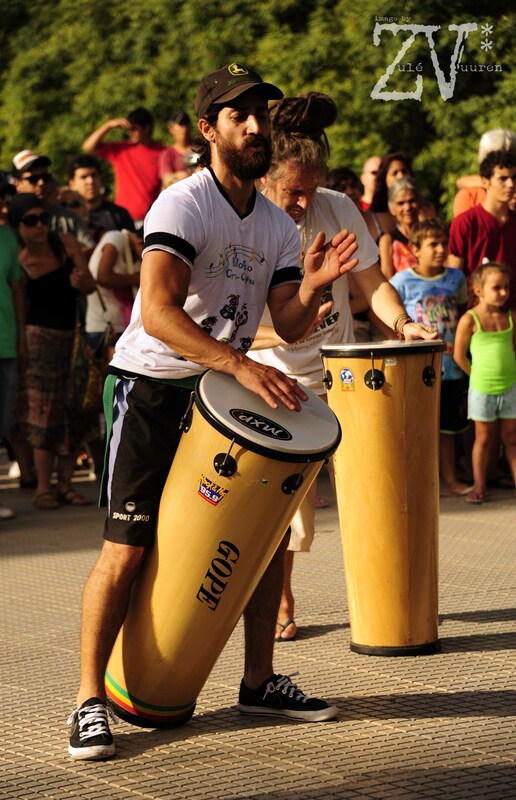 We are delighted to hear drumming in the distance. 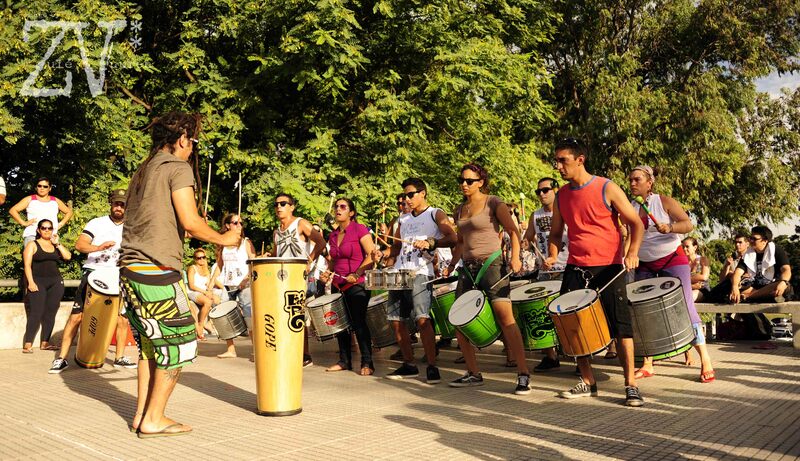 We follow the beat and find a small group of drummers doing their thing with a growing crowd around them enjoying the ethnic beats. I need to get a drum. We lie on the grass chatting the daylight away. Learning more about Bart, his family and his way of life in his city. I even manage to take a little nap before we lazily make our way back to Villa Crespo. We are in desperate need of some beef, some red meat, some decent protein. Argentina is known for their quality beef, the cows outnumber the people in this country. 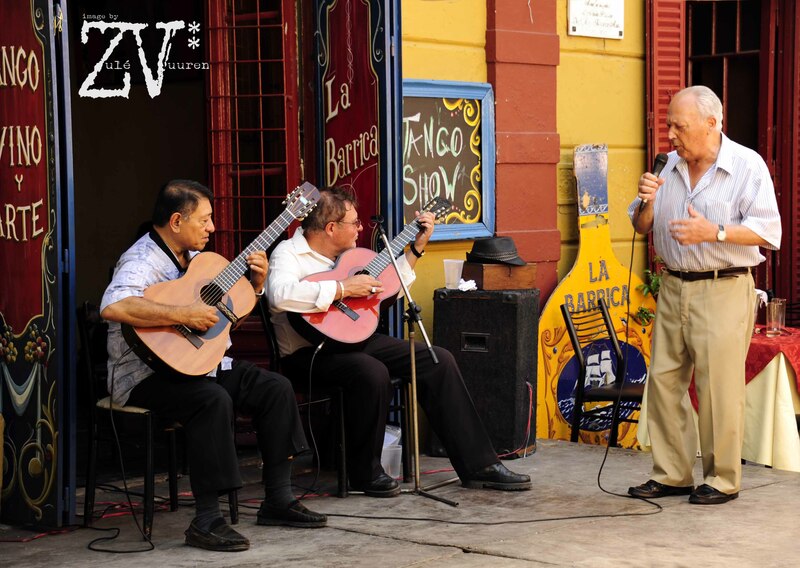 So tonight we are going to Bart’s uncle’s Parilla restaurant, Fiera, situated at Viel 733, Buenos Aires – in the middle of the city. It is in an up and coming area that attracts the young elite of the city. I order the best piece of steak I have EVER eaten in my life! I wish it would never end. We enjoy a bottle of red wine and a traditional baked cheese dish along with our meat, and I am thoroughly satisfied with our last dinner in Buenos Aires. On second visit I have come to see so many different parts of the city, and I now understand, somewhat, the pulse beneath the city of good air. We are a bit sad to leave, and I will think back to our days in this hot metropolis with a smile. Maybe we will be back one day. Tomorrow we hop on a 14 hour bus ride to the small town of La Falda in the mountainous province of Cordoba in the central northern part of Argentina. We need some rest and relaxation in the fresh air, and I think a detox is on the cards too. 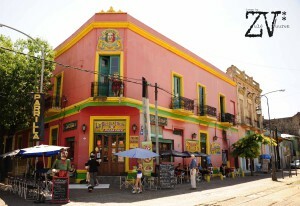 This entry was posted in Argentina, Travel and tagged adventure, best, Boca Juniors, Buenos Aires, bus, Camanito, club, colourful, Couchsurf, Eva Peron, fisherman, football, grave, heat, ice cream, La Boca, lunch, paint, Palermo Soho, Recoleta, restaurant, river, smoke, steak, streets, tango, tombstone, train, Villa Crespo, wine. Magical! Who needs a book when you have a blog like this! Best read yet! and I love the pictures!!! 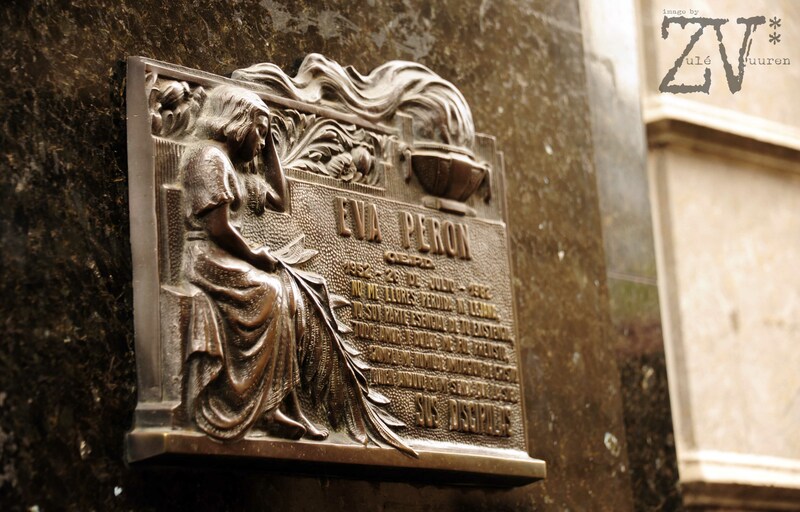 I so wish I had given you a tip to find Eva Peron’s resting place at this location. 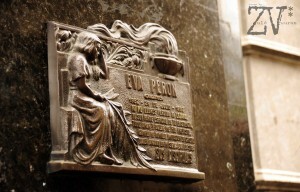 As she had come from simple background, she was not interred with the Peron family plot and is not listed under “Peron” on the directory, rather her remains are in the “Duarte Familia” crypt. Many people have the same difficulty with this.